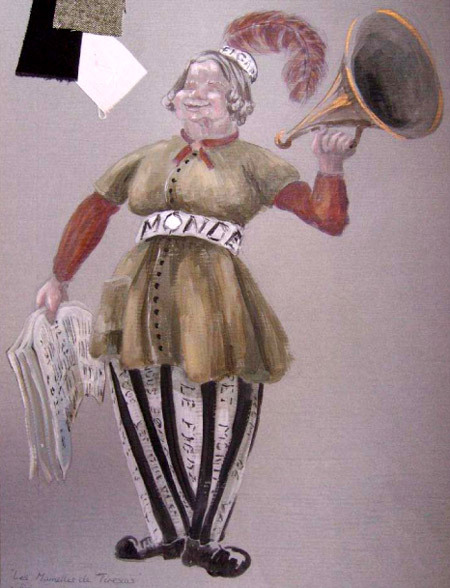 Costume sketch for the opera Les Mamelles de Tiresias, by Fransois Poulenc, libretto by Guillaume Apollinaire directed by Bengt Peterson (1980) for The Norwegian National Opera and Ballet. This opera buffé is against war as a social solution. Adele Änggård has worked as theatre and costume designer, interested in the energy created between the stage and public in live performances. Her work extends from classical to modern plays, from ballet to opera over four decennia, in productions that took her from north, south east and west of Europe. Designs that were done both before and after the fall of the Iron curtain, where oscillating political conditions created enormous variations in audience responses and approach to scripts. 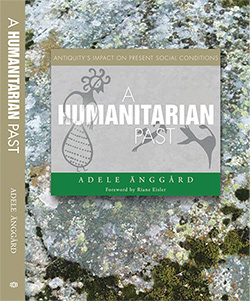 A Humanitarian Past opens a window on our early history. Large numbers of newly discovered figurine sculptures, when laid beside ancient Greek myths, dramas, and epic poems show antiquity had an intimate knowledge of their predecessor’s social value system. Riane Eisler, the renowned author of the book The Chalice and the Blade; Our History, Our Future observes Änggård brings both a passionate voice and a unique background to this task of showing not only that we can build but also that we actually have built, more humanitarian societies.